It all seemed so simple. Alas. Mo is in Seattle. I am not. Which means I have way too much time on my hands. Damn that devil and his workshop. Which leads me to the evening’s harmless diversion: A video explanation of How To Untangle a Headphone Cord Using Nothing But A Pint of Blue Bell Ice Cream. The sheer genius in this plan is impossibly clear. 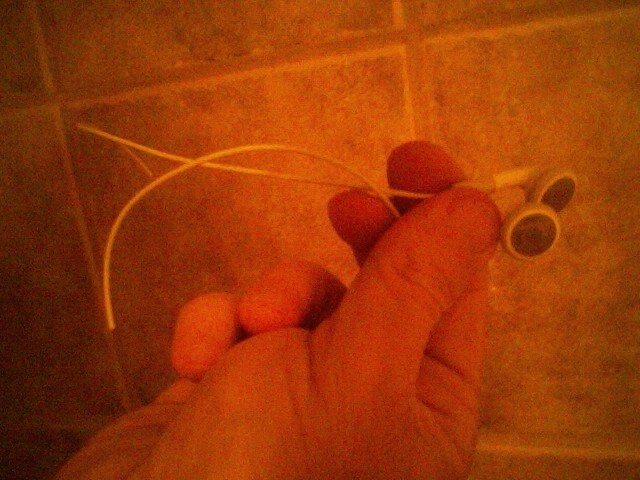 I have a pair of headphones that recently died a quick, painless death from sweat. The day they make a pair of headphones that I can’t kill with a month of running is the day I’ll have nothing to do on a slow Thursday night on holiday. But I have no ice cream. So to perform this feat requires a trip to the store. I buy Moo-llennium Crunch (note to blue bell guys: I think we’ve passed the millennium. maybe we should move on?) I also buy a pint of homemade vanilla as an emergency backup. And thus begins the stunt. I sit in front of the computer with the video recorder on. A John Prine/Iris DeMent duet plays in the background (with a monkey reference!). I say nothing, merely looking at the headphones, then the ice cream. The lid comes off and I begin eating ice cream. More looking at the huge knot in the cord. More ice cream. More staring at knot. More ice cream. How can he do this? How can he possibly untangle that mess in 3 1/2 minutes and one pint, the crowd asks breathlessly. As the song ends, I put down the spoon. And pick up some scissors, cleanly cutting the cord. The knot drops harmlessly to the floor. Problem solved. OK, it’s not great. But it’s Thursday and I’m on holiday so I don’t need to be particularly creative. But it’s pretty funny. I go to hit the stop button, and. I realize I never hit start. This is not a stunt you get a do-over on. I’m screwed. I notice Mo’s iPod earbuds are on the kitchen counter. Come to think of it, she rarely uses them at all. She has some fancy-pants earphones as her first-stringers, and these are just sitting here, lonely. Looking a little suicidal. Besides, she really shouldn’t listen to music while running anyhow. The treadmill can be treacherous. This is for her own good. And if the cord goes this way and then that and the plug goes through here and then wraps around itself, GOOD LORD LOOK AT THAT MESS OF A CORD! SOMETHING MUST BE DONE! I go to the emergency backup ice cream. I set John and Iris up to play an encore. I make CERTAIN I have hit the play button. Again, I eat ice cream. But this time it’s even better. I make a monkey face when the lyric comes around. i sway rhythmically to the chorus. I look at the cord repeatedly with the weary expression of one who has faced this dilemma too many times before. As the song ends, ice cream down. Scissors up. I cut the cord. And hit stop. The recorder stops. I ponder what the entry deadline is for the Sundance Film Festival and whether long pants are required for my acceptance speech. I am using a crappy program called photobooth that is fine for photos, but sometimes loses interest early when recording video. In this case, five seconds. 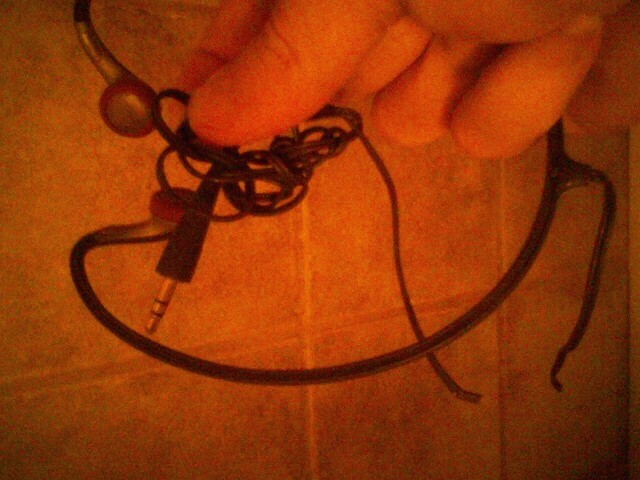 I have just killed Mo’s perfectly good headphones for absolutely no reason. Which leads to the big problem. Mo is in Seattle. She took the good headphones with her and won’t be back till next week. I hit the pause button on my creativity. I make a mental note to stock up on ice cream. Three’s a charm. This entry was posted in running and tagged i dream of sleep, life. Bookmark the permalink. Hahahahahahahahaha! I have some extras if you would like me to send them to you. I got some left over duck tape. (and I could send Mrs TO’s headphones). i would like to see the monkey face. would that be possible? i like monkeys.